Puma SE, branded as Puma, is a German multinational company that designs and manufactures athletic and casual footwear, apparel and accessories, which is headquartered in Herzogenaurach, Bavaria, Germany. PUMA is the third largest sportswear manufacturer in the world. The company was founded in 1948 by Rudolf Dassler. In 1924, Rudolf and his brother Adolf Dassler had jointly formed the company Gebrüder Dassler Schuhfabrik (Dassler Brothers Shoe Factory). The relationship between the two brothers deteriorated until the two agreed to split in 1948, forming two separate entities, Adidas and Puma. Both companies are currently based in Herzogenaurach, Germany. Puma has been a public company since 1986, listed at the Frankfurt Stock Exchange. French luxury group Kering (formerly known as Pinault-Printemps-Redoute or PPR) holds 16%, Kering's largest shareholder Artemis SA owns 29% of the share capital. Since 1 July 2013, the company has been led by former football professional Bjørn Gulden (CEO). As of 2017, Puma SE employs more than 13,000 people worldwide and distributes its products in more than 120 countries. Puma offers products for Basketball, Football, Running, Training and Fitness, Golf, Motorsports and Sportstyle. In the past, it sponsored a number of legendary athletes, including Pelé, Eusébio, Johan Cruyff, Diego Maradona, Lothar Matthaus, Clyde Frazier, Jim Hines, Boris Becker, Martina Navratilova, Tommie Smith, Joe Namath, Linford Christie, Colin Jackson, Heike Drechsler and Michael Schumacher among others. Currently, international footballers Cesc Fàbregas, Sergio Agüero, Antoine Griezmann, Hector Bellerin, Yaya Touré, Olivier Giroud, Marco Reus, Romelu Lukaku, Luis Suárez, David Silva, Vincent Kompany and many more are sporting Puma football boots. In terms of football clubs, Puma sponsors Manchester City, Borussia Dortmund, Independiente, C.D. Guadalajara , A.C. Milan, L.D.U. Quito, Olympique de Marseille, Sociedade Esportiva Palmeiras, Borussia Mönchengladbach and Bengaluru FC . National football teams Italy, Serbia, Switzerland, Austria, Cameroon, Ivory Coast, Ghana, Senegal and Uruguay and Olympic Handball Champion Denmark are also endorsed. In Athletics (Track and Field), Puma sponsors the Jamaican, Cuban, Bahamas, Grenada, Trinidad & Tobago, Dominican, Barbados, Portugal,Swiss and Norvegian Athletic Associations. In addition, Puma sponsors the Olympic Associations of Jamaica, Bahamas, Cuba, Grenada and Trinidad & Tobago. It also has the world’s fastest man and Jamaican track athlete Usain Bolt under contract along with other track and field athletes like Andre Degrasse, Will Claye and Pierre-Ambroise Bosse. Over the past decades, several world records were achieved by athletes wearing PUMA shoes, such as Heinz Futterer (1954), Armin Hary (1960), Jim Hines (1976), Tommie Smith (1968), Asafa Powell (2005), and Usain Bolt (2009). In 2018 Puma announced its entrance back into basketball after a break of almost 20 years. The brand appointed Jay-Z as Creative Director of Puma basketball. Marvin Bagley, Deandre Ayton, Zhaire Smith, and Michael Porter Jr. are the first players to join PUMA’s basketball roster and play in performance PUMA basketball shoes. From 2018 Puma became the official apparel sponsor of New Zealand's national netball team, the Silver Ferns. The firm sponsors Indian cricketer Virat Kohli the captain of the India national team, as well as former Black Caps captain Brendon McCullum. Golfers such as Rickie Fowler, Bryson DeChambeau and Lexi Thompson are equipped by Puma's golf brand Cobra Puma Golf. In Formula 1, Puma equips the teams of Mercedes AMG Petronas, Scuderia Ferrari and Red Bull Racing. In addition, Puma also sponsors BMW in all its Motorsports activities. In order to support its women’s business, PUMA endorses supermodel Cara Delevingne and actress/singer Selena Gomez. In December 2014, Rihanna was also named Creative Director, overseeing direction of the womenswear line. Puma is now also a proud sponsor of the Korean boy band, BTS (band), as of 28 February 2018, they are now one of Puma's many global ambassadors due to the band's major rise in fame. Singers The Weeknd and Big Sean are also brand ambassadors, having created their own collections. The company has a few dozen small corporate offices around the world, and four "international hubs": Boston, Massachusetts (moving to Assembly Row, Somerville, Massachusetts); Hong Kong; Ho Chi Minh City, Vietnam; and global headquarters in Herzogenaurach, Germany. At the 1960 Summer Olympics PUMA paid German sprinter Armin Hary to wear PUMAs in the 100 metre sprint final. Hary had worn Adidas before and asked Adolf for payment, but Adidas rejected this request. The German won gold in PUMAs but then laced up Adidas for the medals ceremony, to the shock of the two Dassler brothers. Hary hoped to cash in from both, but Adi was so enraged he banned the Olympic champion. 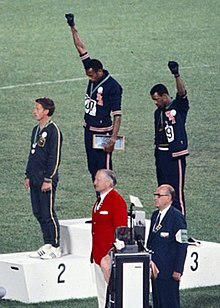 PUMA sponsored Gold medalist Tommie Smith (center) and bronze medalist John Carlos (right) showing the raised fist on the podium after the 200 m race at the 1968 Summer Olympics; both wear Olympic Project for Human Rights badges. During the 1968 Olympics Black Power Salute, Puma sponsored African-American athletes Tommie Smith and John Carlos after having won gold and bronze in the 200 meters respectively they took to the podium with their Puma Suedes in hand and bowed their heads and raised their black-gloved fists in silent protest during the playing of the national anthem, an act meant to stand up for human rights and to stand up for black Americans. PUMA became a public company in 1986, and thereafter was listed on the Börse München and Frankfurt Stock Exchange. It also introduces the RS Computer shoe, with "RS" standing for "running system," an integrated device that measured runner's speed, pace, and caloric use. It sold poorly. For the fiscal year 2003, the company had revenue of €1.274 billion. PUMA was the commercial sponsors for the 2002 anime series Hungry Heart: Wild Striker, with the jerseys and clothing sporting the PUMA brand. PUMA ranks as one of the top shoe brands with Adidas and Nike. As of July 2007, PPR owns over 60% of PUMA stock. Puma holds a 5% stake at German sports club Borussia Dortmund, whose supplier has been the company since 2012. The company has been led by former football professional Bjørn Gulden (CEO) since 1 July 2013. In 2014, PUMA and Arsenal Football Club entered a long-term merchandising partnership. The commercial partnership represents the biggest deal in PUMA and Arsenal's history. In March 2018, Puma launched its venture with its ambassador Selena Gomez called "Phenom Lux''.In 2018, Puma re-entered the basketball sneaker market for the first time in 20 years and announced Jay-Z will be the creative director for Puma Basketball. Puma last sponsored Vince Carter in 1998. They signed young basketball players Marvin Bagley III and Deandre Ayton, both of whom became the Top 2 picks of the 2018 NBA Draft. In December 2018, Puma reintroduced the RS Computer, with "RS" standing for "running system." The shoe contains technologies such as an accelerometer and Bluetooth. Organizations that were promoting fair trade and worker's rights did not criticize[clarification needed] PUMA's employment practices in their developing world factories, predominantly relating to workers in China, Turkey, El Salvador, and Indonesia. The company has made some steps towards greater transparency. In 2000, PUMA began auditing all of its suppliers on a yearly basis, and makes the results available in its sustainability reports. Since 2005, it has publicly provided a list of its suppliers. In May 2011, The Guardian released an article saying that Puma was the "world's first major company to put a value on its environmental impact". According to the article the company "has made a commitment that within four years, half its international collections will be manufactured according to its internal sustainability standard, by using more sustainable materials such as recycled polyester, as well as ensuring its suppliers develop more sustainable materials and products." Puma is also known for boosting positive environmental practices in its supply chain through financial incentives. The innovative Supply Chain Finance scheme implemented links the sustainability performance of key suppliers to the costs at which they can access finance. Such scheme won the company an "Innovation Award" in Supply Chain Finance in 2016. 1930s: With the rise of Adolf Hitler in the 1930s, both Dassler brothers joined the Nazi Party, with Rudolf reputed as being the more ardent National Socialist. They produced boots for the Wehrmacht. 1948: The brothers split, forming PUMA (at first, Ruda) and Adidas. In the same year, PUMA’s first football boot, the "ATOM", was launched. 1952: Rudolf Dassler developed the "SUPER ATOM", a football boot with screw-in studs. 1953: Development of ATOM's successor: the BRASIL. 1959: The company is transformed into a limited partnership named PUMA-Sportschuhfabriken Rudolf Dassler KG. 1970: A few months prior to the 1970 FIFA World Cup, Armin Dassler (Rudolf's son) and his cousin, Horst Dassler (Adi's son), sealed an agreement which was dubbed "The Pelé pact". This agreement dictated that soccer player Pelé would be out of bounds for both Adidas and PUMA. However, Pelé complied with a request by PUMA's representative Hans Henningsen to increase the awareness and profile of PUMA after he received $120,000 to wear the Formstrips. At the opening whistle of a 1970 World Cup finals match, Pelé stopped the referee with a last-second request to tie his shoelaces before kneeling down to give millions of television viewers a close-up of his PUMA shoes. This outraged Horst and future peace agreements were called off. 1973: Launch of the Clyde. Designed for basketball player Walt "Clyde" Frazier, this model gained wide popularity. 1974: Rudolf Dassler died on 27 October. Both his sons Armin and Gerd inherited the company and after a legal dispute between the two, Armin Dassler took over the company. 1985: Boris Becker helps develop the shoe that bears his name. Martina Navratilova is under contract with PUMA from 1984 to 1987. 1986: Transformation into a stock corporation. The company went public as "PUMA AG" was listed on the Munich and Frankfurt stock exchanges. 2002: PUMA ends tenure as an on-field supplier for the NFL, when Reebok is announced as the league's sole official uniform and apparel sponsor for 10 years (2002-2011). PUMA and Serena Williams unveiled the "Serena Williams Tennis Collection". 2008: Melody Harris-Jensbach is appointed Deputy CEO; Designer and artist Hussein Chalayan becomes Creative Director, PUMA also acquires a majority stake in Chalayan's business and Hussein Chalayan. 2011: PUMA becomes a European corporation under the name of PUMA SE. Franz Koch is named Chief Executive Officer. PUMA took over Bodywear and Socks company Dobotex. The company released the first Environmental Profit and Loss Account which valued PUMA’s environmental impact at 145 million Euros. 2014: PUMA and Arsenal Football Club entered a long-term merchandising partnership. The commercial partnership represents the biggest deal in PUMA and Arsenal's history. 2016: PUMA endores it's casual wear deal with Virat Kohli as a new Cricket Brand ambassador and creative collaborator in India of worth ₨.110 crores. 2017: Puma released sneakers known as "Money in the Bank", in relation to WWE's annual pay-per-view, of the same name. 2017: PUMA signs a five-year deal to make kits for Olympique de Marseille, starting from the 2018-19 season. 2018: Kering announces it will spin off a 70% stake in Puma to its shareholders while retaining directly 16%. 2018: Puma collaborates with Hello Kitty to launch the Puma X Hello Kitty For All Time collection. 2018: PUMA & A.C. Milan announced an official long-term partnership, effective on 1 July 2018. 2018: BTS became PUMA's Global ambassadors. 2018: PUMA signs a three-year deal to make kits for Palmeiras, starting from the 2019 season. 2018: PUMA re-entry into the basketball sneaker category for the first time in 20 years and announced Jay-Z will be the creative director of Puma Basketball. 2019: PUMA and City Football Group signed a global long-term partnership, the deal is the largest deal both organisations have signed, the deal will see PUMA supply Manchester City F.C., Melbourne City FC, Girona FC , Club Atlético Torque and Sichuan Jiuniu F.C. ^ a b c d e "Puma FY 2018" (PDF). Retrieved 5 December 2018. ^ "The Top 3 Brands in Sportswear". sportsleisurewear. Retrieved 14 October 2017. ^ "PUMA® – PUMA welcomes planned Change in Ownership Structure". about.puma.com. Retrieved 6 June 2018. ^ "PUMA at a Glance". PUMA. Retrieved 28 October 2016. ^ Smit 2009, p. 31. ^ Smit 2009, p. 33. ^ "The 20 Most Iconic Sneakers in Olympic History". Complex. Retrieved 12 June 2018. ^ "A Culture of "Firsts" - PUMA CATch up". PUMA CATch up. 15 June 2017. Retrieved 12 June 2018. ^ "Puma Relaunches Basketball Division With Multiple Signings, JAY-Z Joins as Creative Consultant". Retrieved 20 June 2018. ^ "Puma Has Signed Deandre Ayton And Marvin Bagley To Sneaker Deals". UPROXX. 18 June 2018. Retrieved 20 June 2018. ^ "Zhaire Smith signs shoe deal with Puma". Viva The Matadors. Retrieved 20 June 2018. ^ "PUMA set to take to the court with Vixens partnership". Melbourne Vixens. Retrieved 4 September 2018. ^ "Rickie Fowler Signs a Long-Term Extension with Puma Cobra Golf | Success Series". Success Series. 2 February 2018. Archived from the original on 12 June 2018. Retrieved 12 June 2018. ^ "DeChambeau Turns Pro, Signs Deals With Cobra Puma, Bridgestone". Golf.com. Retrieved 12 June 2018. ^ "Lexi Thompson signs extension with Cobra Puma". Retrieved 12 June 2018. ^ "All Six BMW M4 DTM Liveries Revealed Before 2018 Season Kick Off". BMW BLOG. 8 March 2018. Retrieved 13 June 2018. ^ Schlemmer, Zack (17 May 2018). "Cara Delevingne Helps Puma Introduce Cut-Out Sneaker Perfect for Summer". Footwear News. Retrieved 13 June 2018. ^ "Selena Gomez Debuts Puma's New Training Shoe". Sole Collector. Retrieved 13 June 2018. ^ a b Lauren Milligan (16 December 2014). "Rihanna Named Creative Director Of Puma". Vogue. ^ "The New PUMA x XO Parallel Colorway Spotted In The Weeknd x Belly's Latest Visual | RESPECT". respect-mag.com. Retrieved 13 June 2018. ^ "Big Sean x Puma Suede + Clyde Release Info | SneakerNews.com". Sneaker News. 14 May 2018. Retrieved 13 June 2018. ^ "PUMA Locations". Retrieved 1 February 2019. ^ a b "The Town that Sibling Rivalry Built, and Divided". Deutsche Welle – dw-world.de. 7 March 2006. Retrieved 6 November 2010. ^ a b c "How Adidas and Puma were born - Rediff Sports". Rediff.com. 8 November 2005. Retrieved 15 January 2012. ^ Smit 2009, p. 18. ^ "Puma AG Rudolf Dassler Sport". Fundinguniverse.com. Retrieved 6 November 2010. ^ a b initclock() (19 August 2011). "The Top Ten Shoe Companies In The World| Top Tens List| World Tens". World Tenz. Archived from the original on 29 December 2011. Retrieved 15 January 2012. ^ "Puma Pays Homage to Tommie Smith and the Black Power Salute in New "BHM" Collection". complex. 27 January 2016. Retrieved 29 January 2016. ^ Matthews, Peter (22 March 2012). Historical Dictionary of Track and Field. Scarecrow Press. ISBN 9780810879850. ^ a b c d e "PUMA® – History". about.puma.com. Retrieved 3 September 2015. ^ As it Happens, Fitness-tracking shoe was considered 'useless' in 1986 - now Puma is bringing it back, CB C Radio, December 12, 2018. ^ a b Thomas, Rob (7 January 2015). Big Data Revolution: What Farmers, Doctors, and Insurance Agents Can Teach Us about Patterns in Big Data. John Wiley & Sons. ISBN 9781118943717. ^ "Puma sees sharp fall in profit". BBC News. 19 February 2007. Retrieved 22 May 2010. ^ "Puma's shares surge on bid rumour". BBC News. 5 April 2007. Retrieved 22 May 2010. ^ "Gucci-firm PPR buys stake in Puma". BBC News. 10 April 2007. Retrieved 22 May 2010. ^ "Koch ist neuer Puma-Chef". Focus (in German). 25 July 2011. Retrieved 3 August 2011. ^ Passariello, Christina. "Puma Names New CEO". Wall Street Journal. ISSN 0099-9660. Retrieved 3 September 2015. ^ "PUMA and Arsenal announce partnership". Arsenal. 27 January 2018. Retrieved 27 January 2014. ^ Minton, Melissa. "Selena Gomez Designed a Pair of Sneakers—and Socks!—for Puma". Glamour. Retrieved 18 July 2018. ^ "After 20 years, Puma returns to basketball". CNBC. 19 June 2018. Retrieved 18 June 2018. ^ "Puma reissues its nerdiest shoe ever, the RS-Computer". TechCrunch. Retrieved 11 December 2018. ^ "Eliminating Child Labour from the Sialkot Soccer Ball Industry" (PDF). greenleaf-publishing.com. Archived from the original (PDF) on 26 December 2010. Retrieved 12 November 2010. ^ Puma, Puma releases 2007–2008 Sustainability Report, 2009. Retrieved 20 January 2011. ^ Ethical Clothing Australia, Accredited sports brands. Retrieved 20 January 2011. ^ Jo Confino (16 May 2011). "Puma world's first major company to put a value on its environmental impact". The Guardian. ^ "The 2016 Innovation Award: PUMA". Supply Chain Finance Briefing. Retrieved 14 April 2018. ^ Kirschbaum, Erik (8 November 2005). "How Adidas and Puma were born". The Journal. Retrieved 14 July 2008. ^ "PUMA® – PUMA rewriting football history". about.puma.com. Retrieved 3 September 2015. ^ "Puma Football and Basketball Uniforms". Retrieved 3 September 2015. ^ a b c "History of Puma AG Rudolf Dassler Sport – FundingUniverse". www.fundinguniverse.com. Retrieved 3 September 2015. ^ Smit 2009, p. 82. ^ "The John Akii Bua Story: An African Tragedy". SpeedEndurance.com. Retrieved 3 September 2015. ^ "20 Sneakers That Have Lived Double Lives - PUMA Clyde". Retrieved 3 September 2015. ^ "PUMA® – PUMA is a European Corporation". about.puma.com. Retrieved 3 September 2015. ^ "Killing It In Running Science For Over 80 Years - 1989: The Trinomic Sole: PUMA's Most Advanced Tech Yet". Archived from the original on 12 January 2016. Retrieved 3 September 2015. ^ "Jochen Zeitz | Kering". www.kering.com. Retrieved 3 September 2015. ^ O'brien, Kevin J. (12 March 2004). "Focusing on Armchair Athletes, Puma Becomes a Leader". The New York Times. ISSN 0362-4331. Retrieved 3 September 2015. ^ "Quaker City Mercantile: News & Press - Puma Launches New Marketing Strategy". independent.ie. Retrieved 3 September 2015. ^ "Reebok, NFL try fresh start - SportsBusiness Daily | SportsBusiness Journal | SportsBusiness Daily Global". m.sportsbusinessdaily.com. Retrieved 3 September 2015. ^ "Monarchy Regency sells its stake in Puma - New Europe". Retrieved 3 September 2015. ^ "PUMA® – PUMA Announces Collaboration with Philippe Starck". about.puma.com. Retrieved 3 September 2015. ^ "PUMA® – Mayfair acquires a stake in PUMA". about.puma.com. Retrieved 3 September 2015. ^ "PUMA® – PUMA becomes Industry Leader in Dow Jones Sustainability Index". about.puma.com. Retrieved 3 September 2015. ^ Puma. "PUMA(R) Announces Collaboration with Alexander McQueen -- LONDON, May 31 /PR Newswire UK/ --". www.prnewswire.co.uk. Retrieved 3 September 2015. ^ "PUMA® – PUMA welcomes PPR as its new strategic shareholder and its voluntary take-over offer". about.puma.com. Retrieved 3 September 2015. ^ "PUMA® – Contract with PUMA's CEO Jochen Zeitz extended ahead of schedule". about.puma.com. Retrieved 3 September 2015. ^ Energy, We Are. "Jack Wolfskin Appoints Melody Harris-Jensbach Chief Executive". snowindustrynews.com. Archived from the original on 29 December 2014. Retrieved 3 September 2015. ^ "Hussein Chalayan Appointed Creative Director of Puma". www.adweek.com. Retrieved 3 September 2015. ^ "Puma acquires Cobra Golf". 10 March 2010. Retrieved 11 March 2010. ^ Bäumer, Matthias (26 August 2012). "Borussia Dortmund agree an eight-year deal with Puma in a lucrative deal with the German club". London: Football Shirt Maker. Retrieved 26 October 2011. ^ "Hello kitty! Arsenal agree £170m kit deal with Puma the biggest in English football". Daily Mirror. 8 May 2013. Retrieved 7 May 2013. ^ David Siders. "Rhianna Gamechanger". UK Puma. Retrieved 4 June 2014. ^ "Puma clinch Marseille deal". Soccerex. 23 March 2017. Retrieved 23 March 2017. ^ "Kering to spin off Puma to its shareholders". ^ https://plus.google.com/+travelandleisure/posts. "Puma Is Collaborating With Hello Kitty to Launch the Cutest Sneakers Ever". Travel + Leisure. Retrieved 1 February 2018. ^ "PUMA AND AC MILAN ANNOUNCE LONG-TERM PARTNERSHIP". A.C. Milan. 12 February 2018. Retrieved 12 February 2018. ^ "BTS Are Puma's New Ambassadors And We Will Buy All The Athletic Gear". HuffPost Canada. 1 March 2018. Retrieved 25 February 2019. ^ "Palmeiras acerta com a PUMA para fornecer material esportivo a partir de 2019". Palmeiras.com.br. 22 March 2018. Retrieved 28 November 2018. ^ "Jay-Z named president of Puma Basketball". ESPN. 19 June 2018. Retrieved 18 June 2018. ^ "PUMA and CFG sign global long-term strategic deal". mancity.com. Retrieved 28 February 2019. This page was last edited on 18 April 2019, at 12:15 (UTC).